Hello, back again with another layout. 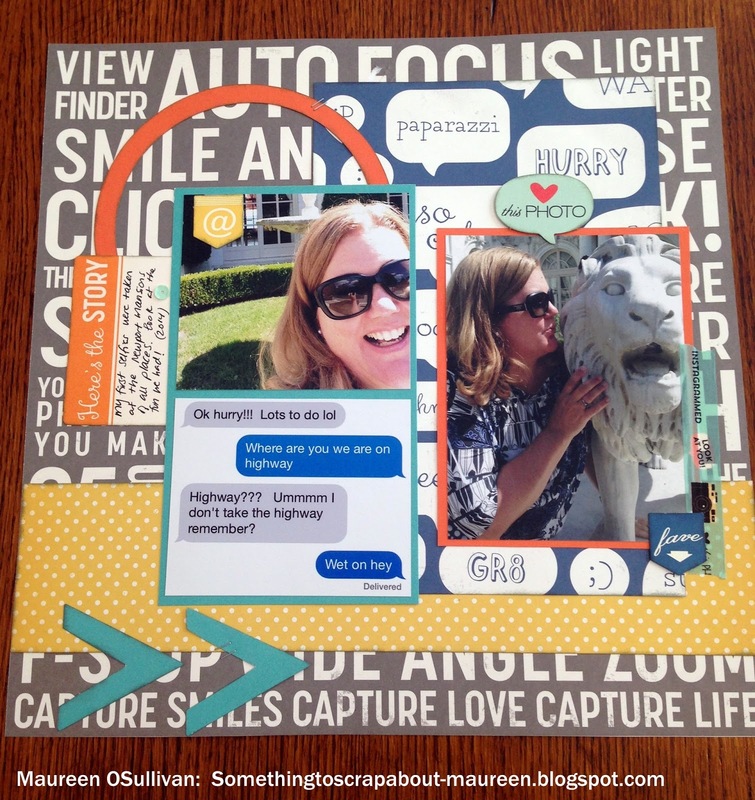 This time I used Teresa Collins' Urban Market line. Teresa Collins is one of my favorite designers. 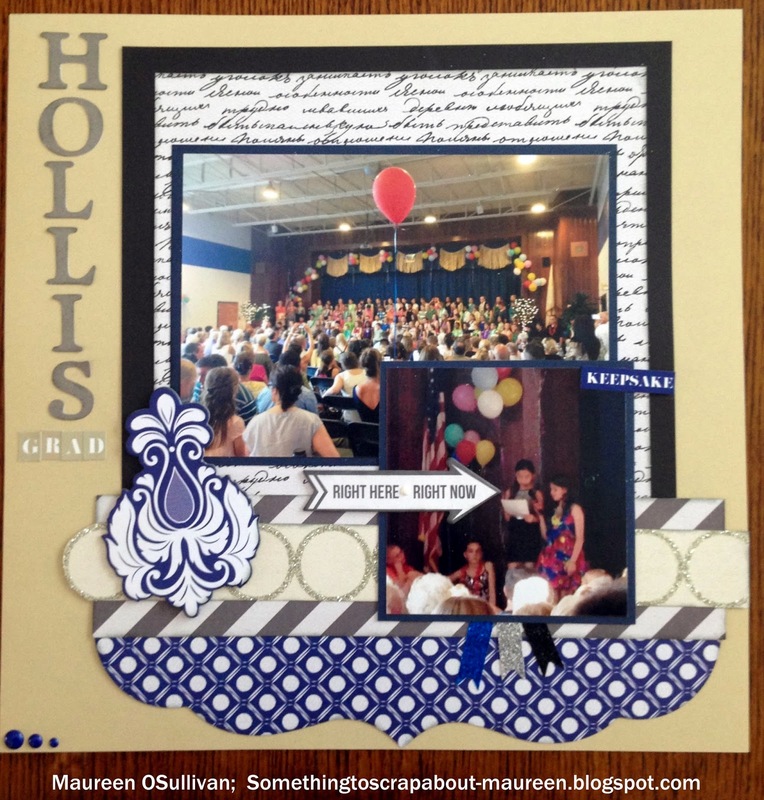 My youngest graduated from elementary school. Our town's colors are blue, so Urban Market goes well. The first page captures all the students on the stage. I also included a picture of Abby reading a poem about her school. Hello, I went to a weekend crop last week and got a bunch of LOs done! Here's one 2-page showcasing October Afternoon's (OA's) Daily Flash line. I was attracted to this line because it had a lot of cameras, flashes, word bubbles, etc. It is chaotic and busy and reminds me of the technical life we now live in-- cell phones, facebook, vine, selfies, etc. But.... I have a confession to make: My first intentional selfie occurred this past summer in Newport RI!!! OMG! I say intentional because I've taken loads of pictures with my iPhone. And, sometimes the lens is pointing at my face by accident and not the subject. I'm sure that has happened to you. You know-- you are taking this awesome picture and you go to look at the iPhone screen and see this person that you don't know looking at you! Then, you realize it's you! And your like-- I don't look that bad?? Do I???? Finally you accept it. Okay its me-- I'll save these pictures for the "before pictures" of the diet I have yet to start:) I'll look better, someday! So enough of what's in my head, it was time to be prepared for the actual, real selfie-- pose, pucker up and take a lot of pictures. Here's what came out...For one of selfies I'm a bit serious. The second one is more like me with the laugh! Here's page 2 of the LO. Guess where we were for celebratory selfie event? The Rosecliff Mansion in Newport RI, a.k.a. The Great Gatbsy mansion. After I stopped with the selfies, my daughter took a picture of my kissing a lion statue. What is next for me?? If you say texting-- I've done that. However, I'm not a master of texting. 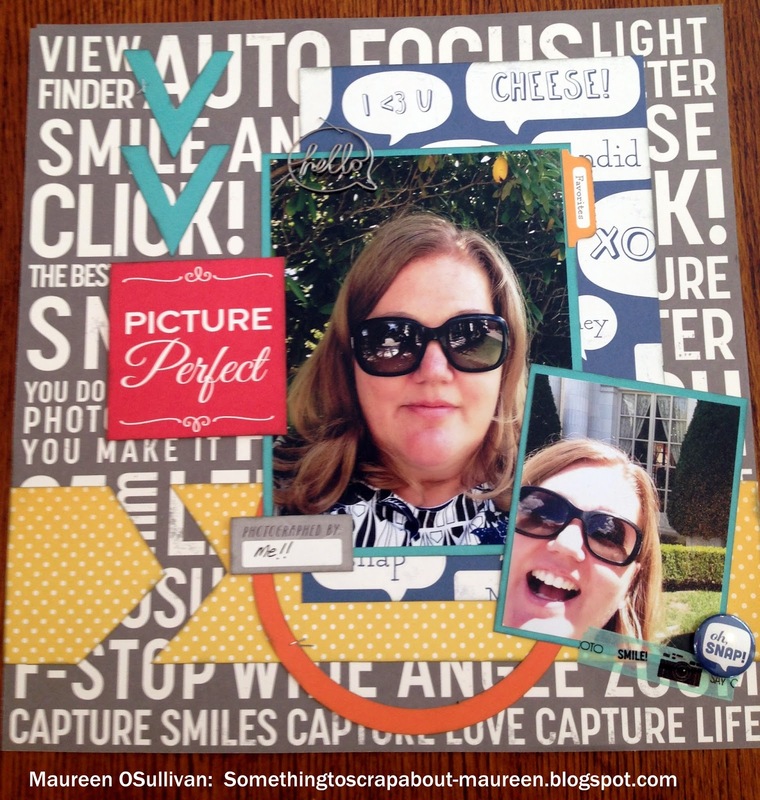 Check out one of the pictures of the pictures in my LO. I wanted to say "I'm on the highway". What came out was "wet on hey"!! Hi everyone, its snowing here again in Boston. We already beat our snow record, so enough with the snow, we are ready for spring! 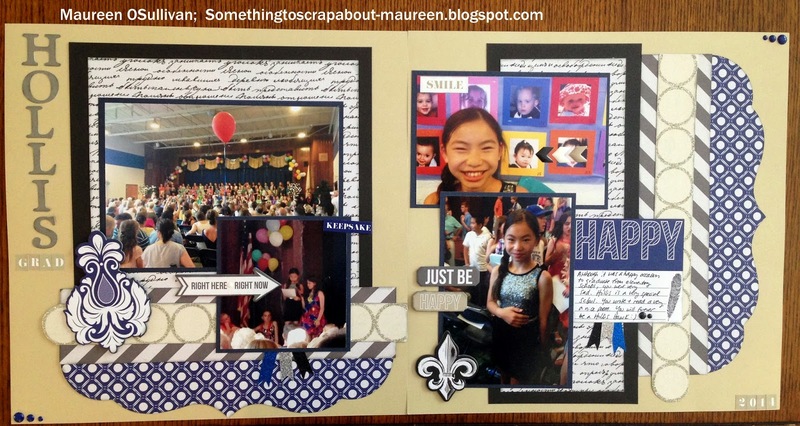 I met Jean ~7 years ago at a local scrapbooking store where she was an instuctor. 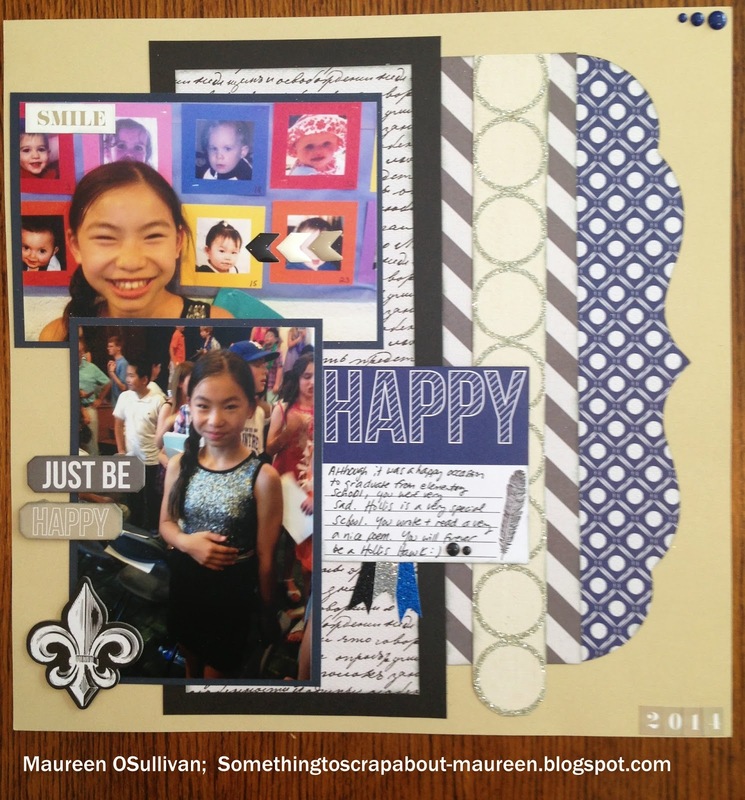 Jean has many styles-- mixed media, card-making, scrapbooking, and metals, etc. She loves a variety and is good at all of it! Well, Jean invited me to a CTMH party that she was hosting and you can guess where that ended! 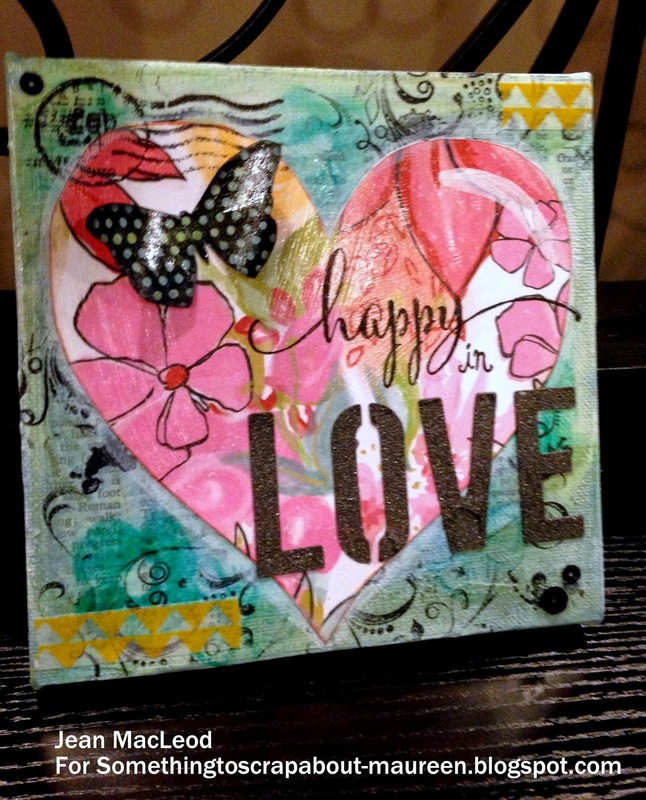 Below is a picture of what Jean created with a 6X6 canvas and a few CTMH stamps, washi tape, black sequin, Brush paper, and other supplies-- such as gesso, medium and modeling paste. 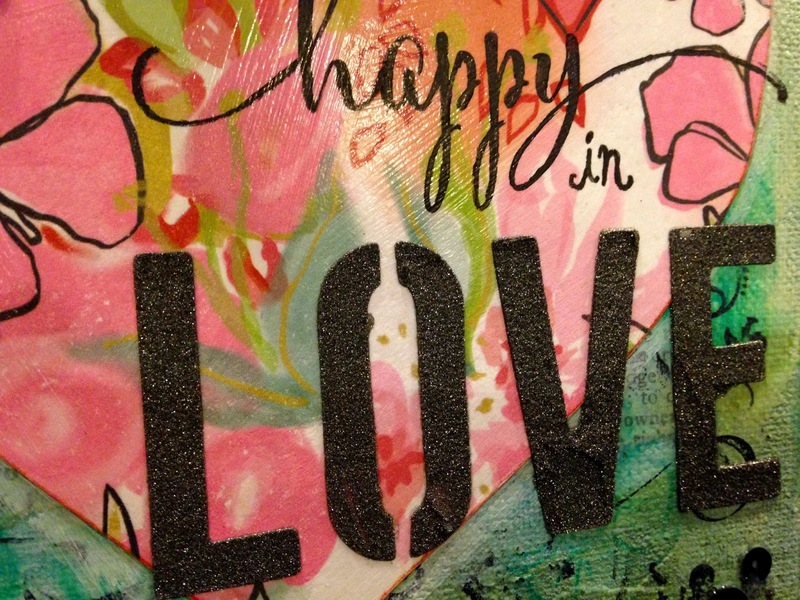 The butterfly and 'happy' sentiment are from the Brushed workshop on the go kit. Here's a close-up of the textured LOVE that we'll be creating. There are many layers to this canvas, making it an adorable keepsake. The class will take 1-1.5 hours and costs $20. To sign up, please pay via paypal or email me at mosmojo65@yahoo.com. Hi, we are having our next crop on Saturday, March 14th. I'm hoping March comes in and leaves like a lamb! This winter has been tough one. 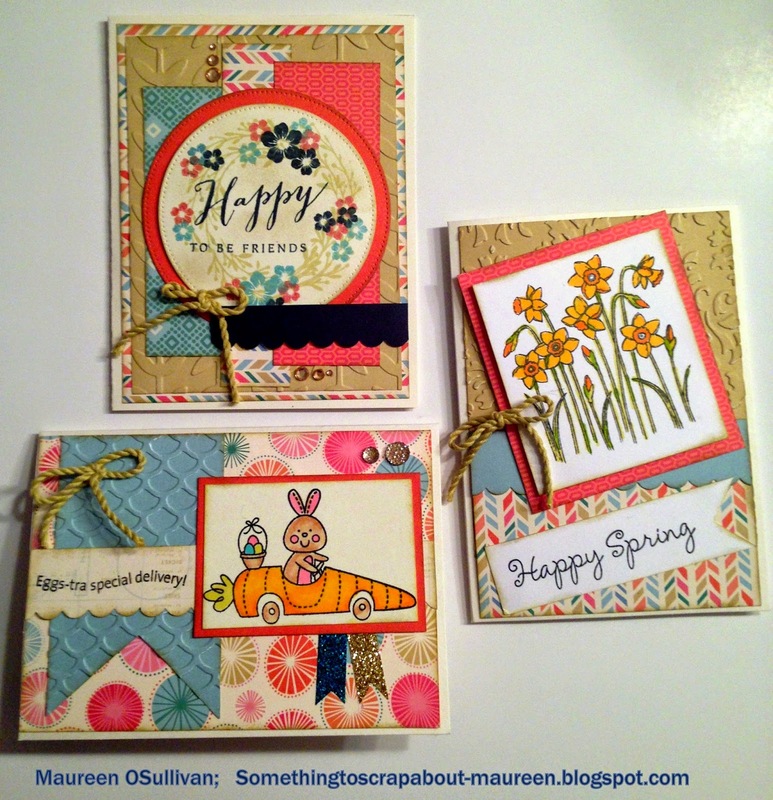 To help bring in the spring, I made a couple more cards using the Hopscotch paper pack. The first card I made a couple of weeks ago 'Happy to Be Friends' using a stamp with that same name. For the Bunny card, I used the 'Hoping By' stamp. It was fun to color it in using CTMH's Shin-Han markers. For the daffodil card, I used the 'A Little Note' stamp and the CTMH markers again. 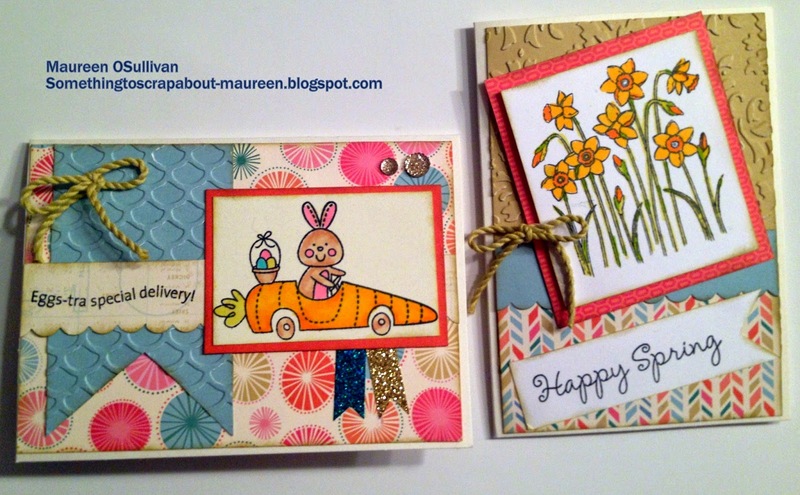 Here is a close up of the Bunny and Daffodil cards. I especially like the Bunny! The stamp set also has a little chicken and lamb-- perfect for my younger niece and nephews! 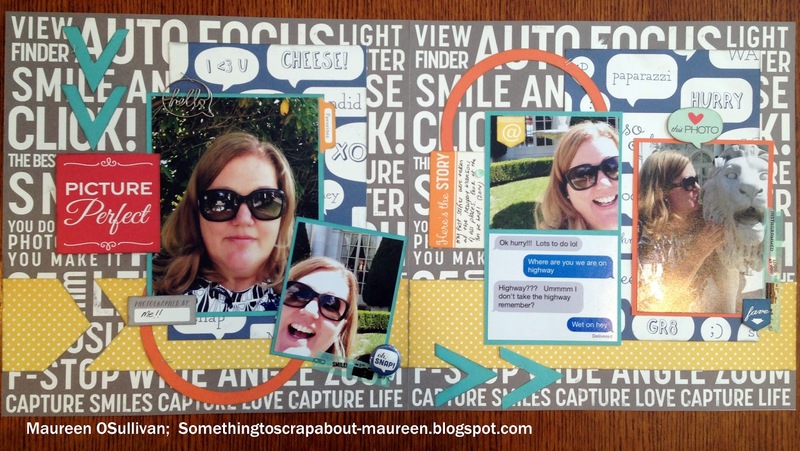 For the card class we'll also be making 1 card using the Artfully Sent Cricut cartridge. I'll post it later in the week.